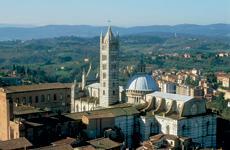 This is a 7 nights and 8 day cycling holiday south of Siena in Italy. The tour starts in Siena and has stop overs in Buonconvento, Montalcino, Bagno Vignoni, Montepulciano and finishes in Castiglion del Lago. The 7 nights are mainly in 3* hotels, on a Bed and breakfast basis. The cycling is graded as Challenging, as this is a hilly, undulating tour with some long ascents up to the hill towns. The maximum distance on any stage is 59km. Bike Hire 78 Euros. Prices includes a Euro currency surcharge of £38.16. (£18.70 on single supplement). You are advised to bring your own cycle helmet and water bottles.